Let me tell you a funny story. Due to congestion issues with the other "good" cable provider, I'm currently with the major "terrible" provider, which imposes a 60GB/month bandwidth limit. I was on campus for 3 hours a few days ago and my wireless meter monitored 24GB downloaded (one of those being The IDOLM@STER ep14); I'm sure it's clear just how painful my home Internet life is. One more month and I'll have the "good" provider. This episode marked the beginning of the second half, complete with a new OP. (It stuck out to me just as much as the old one, which isn't really a lot.) The tone of the episode was very different from the ones preceding it; the girls were a lot more successful in their careers and the genuine happiness was back. 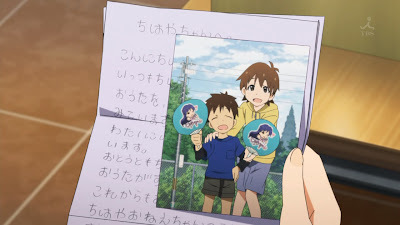 Despite their lively personalities, I always felt a sense of gloom in the air (for the idols other than Ryuuguu Komachi, of course). The episode picked up as the seasons changed from summer to fall (that was a nice touch) and Haruka was back at the helm for the first few minutes. Yayoi has a TV show? That's big. Haruka talked about how the biggest change was that the girls had a lot more jobs, and it was pretty evident with the extremely filled-up board. The episode featured a photo shoot that involved all of the girls, which they were very happy about. While it's nice to see the girls at work, it's interesting how all it took was a successful concert. Seeing as how they didn't do anything special before beginning the training for the concert, I stand to believe that this concert could've been held much earlier. 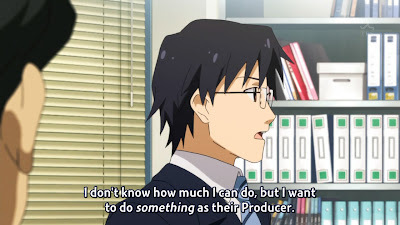 Producer didn't seem to have much of a hand in their newfound success, being as useless of a secondary player as before, but I guess hindsight is 20/20. Concerts do take a lot of money, given the advertising, and this one did showcase Ryuuguu Komachi, which is why so many people attended, so perhaps it was held as soon as possible. This episode also had very clear hints of the roots of this anime, since Miki had begun calling Producer "honey". 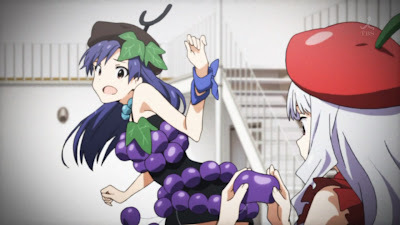 The age difference makes me shudder, but I need to keep reminding myself that this is pretty legal in Japan. (Miki's at least 13, isn't she?) 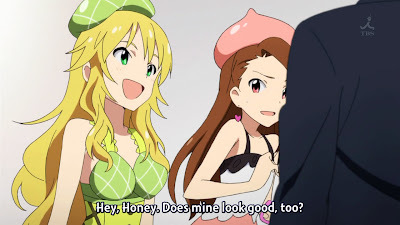 No one seems to have a problem with it, other than feeling jealousy - such as Iori getting annoyed when Miki interrupted her time with Producer. I really don't see the allure and it was this scene that made me feel like I was watching some kind of harem anime. It couldn't be over fast enough. Oh, Takane; when will we see more of you? The shift away from Haruka happened pretty quickly, as this episode wasn't about her, and the other girls were given lots of airtime. 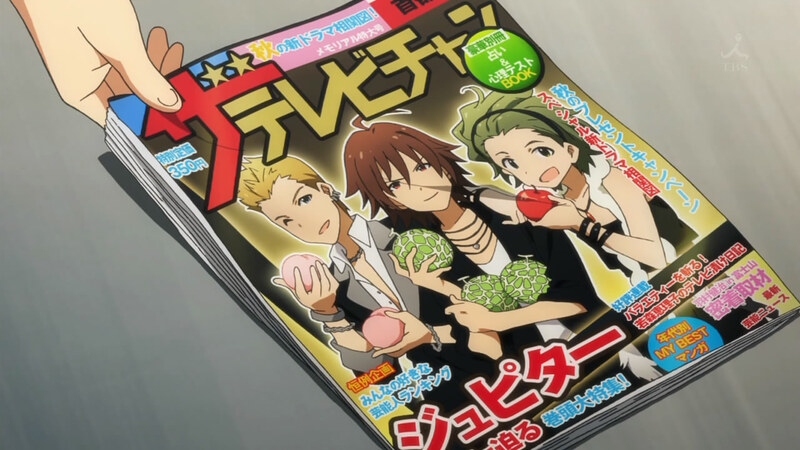 Makoto was apparently getting recognized by fans (as were the other girls, of course) and dabbling in disguises. Takane talked to Yukiho, who seemed to have found her passion in acting (she was part of a musical). Chihaya also seemed pretty happy, being able to sing and record. It's really nice to see that the girls all have various talents, because for a long time it seemed as though they were run-of-the-mill girls that would attempt to conform to whatever the public wanted, especially being brainless and cutesy. By showing some honest desires and talents, I'm a lot more interested. Real-life idols are usually very different, after all; that's how you survive in a supersaturated market. 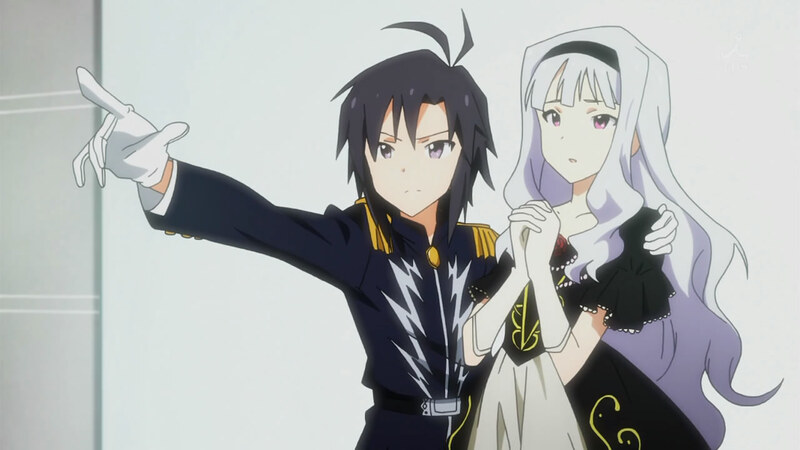 After the insert song, Haruka and Yayoi ran into Project Jupiter yet again. 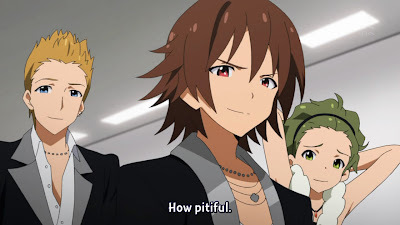 It wasn't surprising that it would be these two that ran into them; without any real spoilers, let's just say that the brown- and green-haired ones are the same age as Haruka and Yayoi, respectively. 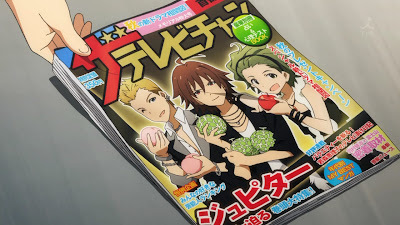 Anyway, the boys of Project Jupiter were incredibly cocky and condescending, the reason becaming clear after a little while - the 765 Pro photoshoot (shown earlier in the episode) for a magazine cover was replaced by Project Jupiter without notice. Once again, I find it very stereotypical that Project Jupiter would be so condescending, but I don't have a good retort. I mean, I don't know any people in the entertainment industry, much less successful ones, so perhaps they're all like that. What a bleak possibility. That actually does look awful compared to the girls' themed costumes. When the girls saw what had happened, the president revealed to them the reason why the president of 961 Pro was targeting them. They were old friends/rivals, with their relationship ending one day due to a particularly hearted argument. President Kuroi (which can actually be the way "961" is pronounced; the ingenuity is just astounding) was simply taking care of the "nail that was sticking out" by hammering it down; the girls of 765 Pro had grown too much too fast, and he was combating that with his own dirty tricks. This obviously sent the girls into a frenzy. I wish you would do something as their producer too. New plot point for later? She obviously misses her sibling. With the preview for the next episode showing some sort of Ami-Mami adventure, amongst other things, I'm suddenly aware that a lot of the idols have had to be covered. 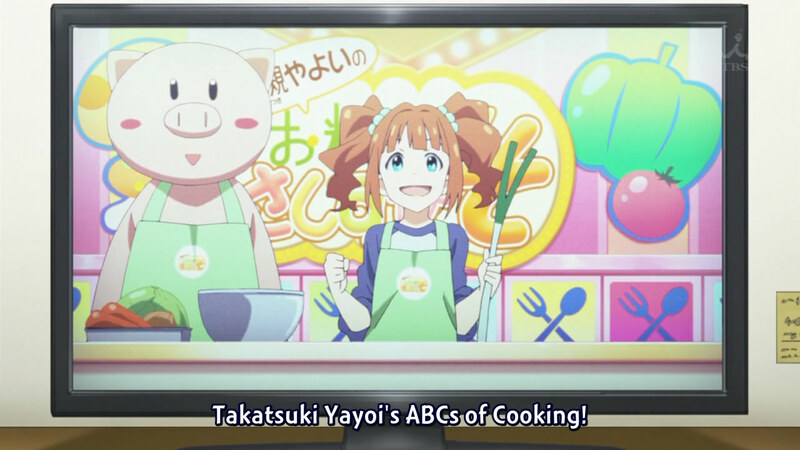 I just want to see Takane's episode already!